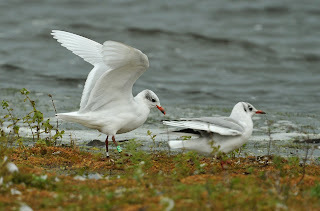 At Stithians Res today, at least four different Mediterranean Gulls were present in the morning at different times. 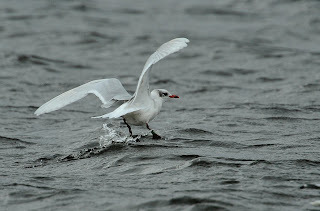 They use the freshwater to bathe and preen and then move back to the coast or fields to feed. 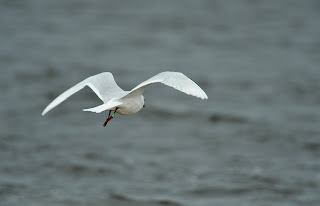 All the shots were taken with the 600mm lens coupled to the 1.7x tele converter. Light was good and the resulting shutter speed got up to 1000th sec. Aperture F/6.7. ISO 800. Exposure 0.0 . 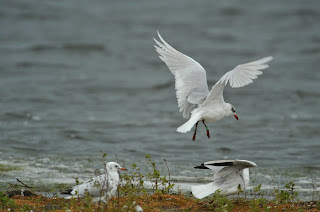 The image of the green ringed adult bird (right leg) above can be zoomed in and has the ring number 3EK2. 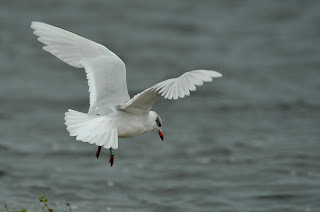 This bird was originally ringed in Belgium in 2002/20/04/ (2002 as an adult) Zandvlietsluis, Antwerpen. 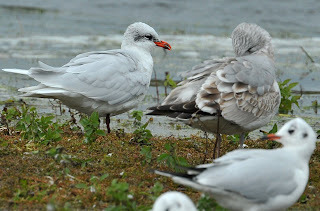 It was subsequently recorded at Swanpool between 2003 and 2006. 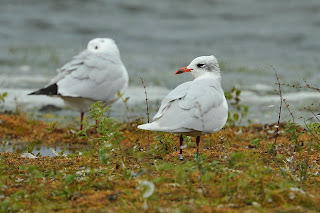 The bird was then recorded in France (Pas De Calais) 12 months later. 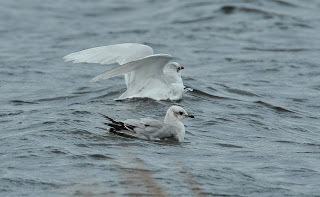 The next sighting was three months later in Jan 2008 in Cornwall at Men-aver beach, Gillan. 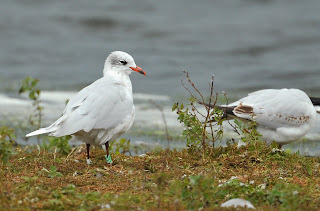 It was then recorded on Gyllingvase Beach, Falmouth in July finally arriving at Stithians reservoir on the 31st October and again on the 2nd November. (per S. Taylor). Above left: Adult with a green ring, but a different mask structure to the other adults in this sequence. Above right: adult bird with no visible rings (although the foot is obscured). The structure of the black mask is also subtlely different with a more prominent downward sweep at the ear coverts. 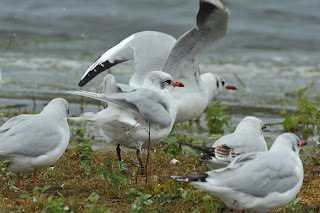 Above left: Bird 3KN7 with green ring on left leg and above right, an adult and first winter bird together.